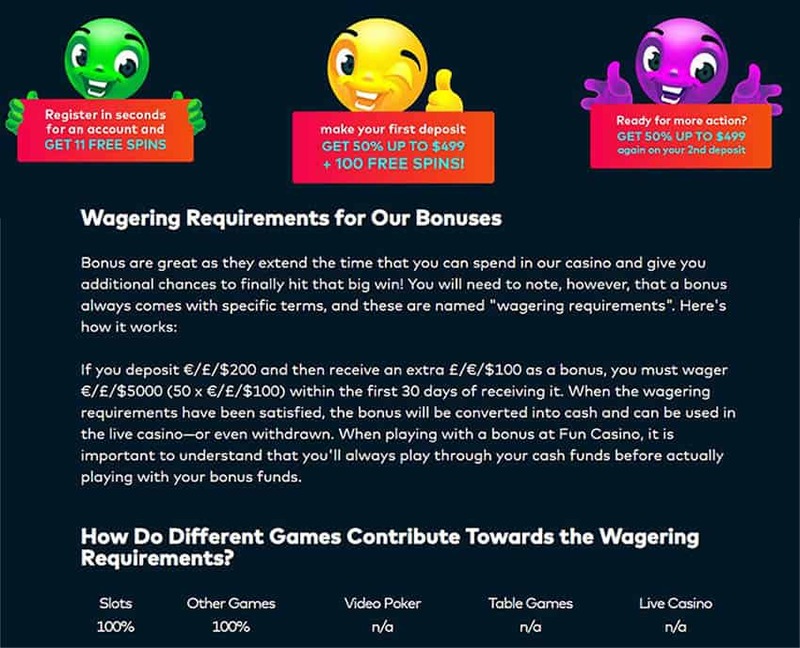 Fun Casino is a young brand – it was launched in 2018 and still have something to work on. But nevertheless, it has licenses from highest class authorities in gambling world which means that its games and services are safe and well-tested. When you get to Fun Casino website – let’s say it has a pretty intuitive interface, but it is a little “crawded”. Anyway, when you get used to it – you feel fine and confident here. 50% upon 1st deposit (up to CAD 499) + 100 free spins! You can use free spins on some slots. Don’t forget to read terms and conditions, because free spins can be used with specific slots. Other rewards that you can get is through regular tournaments (take a look at Promotions page). We must say that prizes are awesome. For example – for the best multiplier win you can get CAD 5000 for the 1st place! Casino provides its customers with many banking methods such as Visa, MasterCard, Neteller, Skrill, EcoPayz, Sofort, Giropay, Paysafecard and others, but if you didn’t find an option that suits you best, you can contact support and receive an assistance. Minimum Withdrawal – CAD 20. Cashouts are fast here and you can use few currencies including Bitcoin. Well, the range of games are nice here. You will find more than 500 (!) video slots, about 70 live casino games – mostly classic like blackjack, roulette, few types of poker and baccarat, more then 30 table games and also video poker and bingo. So, we guess that there will be no time to get bored. Free demo-versions of some games are also available. Software must be good here, because games are loading fast enough even on mobile devices. Also, you can use tools to set personal limits to gaming. Fun Casino is all about responsible entertainment. If you need help you can use either chat, phone call, email or contact form. Support team is multilingual – English, Norwegian, Swedish, Finnish and German languages are available. It works daily from 08:00 (CET) till 01:00 (CET), or 24/7 by email.